We say a big THANKS to Jim McKendrick as he steps down as National President. Jim is a familiar face to members having spent the last five years spearheading work across the country to improve the society and the plight of the poor. Jim McKendrick with Sister Agnes McGarvie, spiritual advisor of the SSVP. He paid tribute to SSVP members, saying: “The number of hours they put in to provide 45,000 visits to people’s homes in one year is astounding. “I’ve been impressed with their dedication, enthusiasm and love of the society. Jim was elected president in 2014 and also became part of the International Executive committee in 2015. He retired as a senior lecturer of accountancy at Glasgow Caledonian University in 2010 and has used his expertise to help the the smooth running of finances that are vital in supporting those in need. Jim praised the charity’s ‘special work’ initiatives, including Ozanam Clubs for the disabled, and the Rendu Project, which supports hearing impaired adults. He has been an SSVP member for around 40 years at St John’s in Stevenston, Ayrshire. SSVP Scotland office manager Jacqueline Laird said: “Jim brought a wealth of professional experience to the role of National President. “I have been struck by how his work always integrates the spirituality and history of the Society, which is rare. 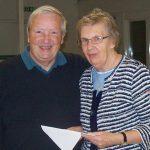 “It is reflective of Jim’s care and concern for those most in need that he will continue his Vincentian work as Chair of Trustees for The Louise Project at The Space, Govanhill (www.spaceglasgow.org.uk). A new president of the SSVP Scotland will be elected on 16th February.